Customise a theme & add your branding Start with one of our colour themes or pick colours that match your existing site. Upload your logo and then upload an optional background graphic for even more customisation. Start accepting orders on minutes - No HTML skils required Off the shelf webstores always promise set up is easy, but most require quite a bit of time to get them up and running. This is different, it’s already set up and working, you just add your name. Full mobile ecommerce site included A webstore that works well on tablets and mobile phones is essential - you wouldn’t choose a solution that didn’t. Our solution is optimised to work on mobile and tablet as standard. You don’t pay any extra for a mobile version with us (unlike some webstores). Accept credit cards & Paypal at no extra costs On some ecommerce platforms you need to set up your own merchant account to process credit card payments - this comes at an extra. Not ours - all payment processing is set up already and doesn’t cost any extra. Watch out for transaction fees too - some webtores charge a percentage per sale. We don’t - we pay you when you make a sale. 100% secure - no extra cost for an SSL certificate On top of other set up fees, some webstores need to you purchase your own SSL certificate, to process payments securely. With our solution security is all taken care of, there’s no additional set up needed and no extra cost. Unlimited bandwidth hosting included Website hosting can be an additional cost and hassle with other ecommerce solutions. With us it’s included and you don’t pay extra for the bandwidth you use (some webstores like to sting you with extra bandwidth costs). Use your own domain name You can make a MoreFrom.Me webstore an extension of your existing website. Use a sub domain like shop.yourwebsite.com. This option is available at no extra cost - some online store providers charge extra to do it. Social network integration You can share links direct to Facebook, LinkedIn, Twitter and Google+ from any page of your site - the tools are built in and will use URLs unique to your site. Email marketing templates To help you promote your site, there are pre-prepared email marketing templates to use. You can easily send out an email of products you recommend and a mail of our best selling products. All the links in the email go to your site. 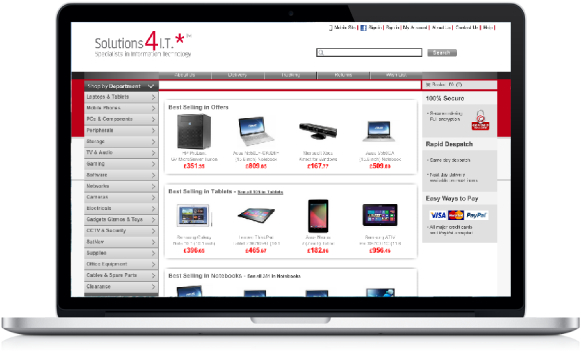 Pre-populated with more items than any other channel website Most of the UKs IT channel distributors offer a pre-populated webstore, but they are expensive and only include products from one distie. Our solution includes products from 22 disties, that’s around 200,000 items. Send quotes to your clients On top of a full feature webstore, you also get a way to send quotes to your client. Select an item or a list of items and send it as an email quote - you customers can click through on the quote and buy there and then. We do all the maintenance, order processing and returns Even the smallest of webstores usually requires some maintenance, even if it’s just to process an order. This solution requires nothing from you - we do it all. Guaranteed commission on every sale Our webstore partner program works in a similar way to an affiliate program. The main difference (apart from getting your own webshop) is that we pay commission on every sale, affiliate schemes usually only pay commission on higher value or higher margin products. Not this one - you earn 1% on every sale (more if you mark up your prices). Mark up prices to earn more commission In our industry making margin on hardware is tough - so when there’s a chance to earn a little more we should take it. For this reason we’ve made it easy to add a markup to the standard web prices. With no fees - It's 100% free. Forever. There’s no charge for any part of our webstore solution and it’s not going to cost you much in time to set it up - you’ll be up and running in minutes.